Routing can be a very tricky issue within ASP.NET MVC and Web API applications. This can be especially true if you have a variety of different routes with varying parameters defined in such a way that a single request could satisfy multiple routes. This blog post will cover some of the precedence rules that are applied to routing in ASP.NET MVC and Web API and how to leverage these to ensure that the route you want to use gets used. What are Routes? How do they work? A Route in ASP.NET simply consists of a pattern and this pattern is going to be mapped to a handler. The handlers themselves can be a variety of different mechanisms (e.g. a physical file, a Web Forms page, or an MVC Controller class). In simplest terms, Routes define how requests are handled within your application. A name to identify the Route itself. A pattern to match URLs to match a request with its appropriate handler. A handler to tell requests that match the pattern where to go. Since the focus of this post isn't really about routing itself and more of routing precedence, I won't go into too any more detail about declaring them. ASP.NET will store all of the defined routes within a Routes Table and when a request comes it, it will look through these routes to determine the one best suited to serve for the request. To know how this works, we need to know how routes are prioritized and that's why this blog post exists at all. tl;dr; Routes match requests using a pattern and tell them where to go. 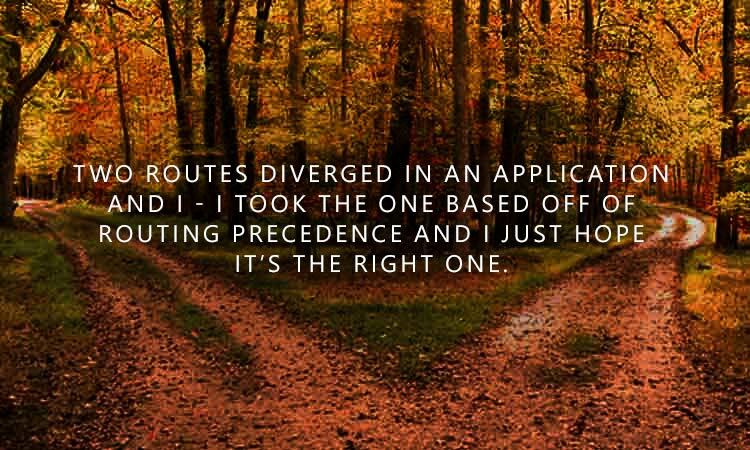 Routing can be a blessing and a curse within an application. It can provide you with the freedom to define all sorts of very creative and easily understandable approaches to accessing data, but when overused, things can get hairy. The primary reason that routing can make you want to pull your hair out is that a single request can match multiple routes. Check the Order property (if available). Wildcard parameter segments with constraints. Wildcard parameter segments without constraints. As a tie-breaker, order the routes via a case-insensitive string comparison. Let's talk about defining Route Order and the different types of routes for a moment to clear things up. You can use the [Route] attribute to explicitly set when a particular route is going to be checked against via the Order property. By default, all defined routes have an Order value of 0 and routes are processed from lowest to highest. This is the primarily reason that it is so important for establishing route precedence, as it's a single attribute that will govern the order that routes are processed. Since the Alpha route has an Order property of 1, it will always be evaluated last out of these three routes. The only scenarios where that would not be true would be if another route had a higher Order value or an equal one (and it received priority via the other criteria). Route parameters are going to have a bit more information that literals, but not by much. The only major difference is that they will have a "placeholder" that can be used to define parameters (similar to the String.Format() method). Wildcard parameters are the last type of parameters to review and you generally won't see these as much as the aforementioned types. These function as "catch-all" parameters and may contain more than a single segment. And that's it as we don't have any ties to break, but if a tie between two routes did exist, then a case-insensitive comparison of the route template names would resolve it. Any requests that come through will be evaluated in that order (i.e. the first pattern to match against the URL will be action that handles the request). One important thing to point out in a post like this is that generally you shouldn't have to deal with routing precedence too often. If you are responsible for building and designing your API, then try to keep your API as simple as possible. Don't try to create this sprawling, verbose API of endless routes unless you absolutely have to. Complicated APIs can lead to complicated problems and in most cases if your API is too difficult to interact with, others won't likely want to use it (especially if you are building a public-facing API).